We want to live life intentionally, define simple and enjoy what is out our front door. For us it starts with living in a tiny house. “It’s really just like staying in a HOTEL ROOM. I am so excited to have had visitors to our tiny house. Yes, we even had overnight visitors. Where will we all sit to eat our meals? 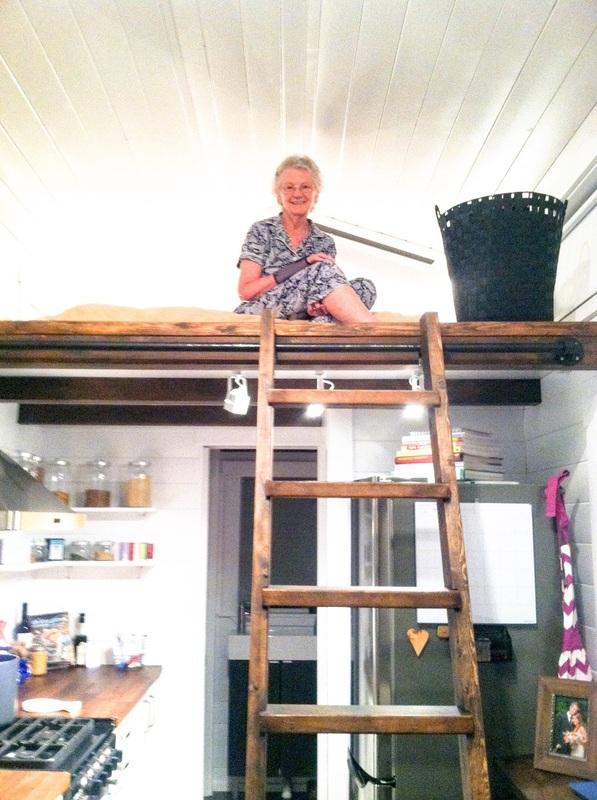 Will people actually sleep in my loft bedroom? Is it uncomfortable to all sleep in the same room? Can you go to the bathroom in a tiny house without all your guests hearing (you know you were thinking it)? Will my guests be awkwardly uncomfortable? To be honest, the list of hostess questions were endless. To date we’ve had three couples visit us: one for a meal, one for a tour, and one overnight. And...Grandma (Oma) even came and stayed overnight! And here’s what they thought and what I learned about being a tiny hostess. 1. IT’S TINY - I know this is obvious, but it must be in the forefront of your mind when you are a tiny house visitor. Pack a “tiny house suitcase”, an overnight bag, not a full size suitcase. 2. NO PRIVACY - I think I have 2 floors and 4 rooms, but visitors remind me my house is two rooms: a bathroom and well, the rest of the house. Going to the bathroom seems to be no problem - it's all in your head that people can hear you. 3. TIME - I find in the tiny house time is measured differently. Everything in a tiny house either is faster or slower than it should be. You have to work around everyone in the tiny house. Planning out timing of certain activities is critical. Mom and Dad being our first guest to eat at our bar style table. I’m learning how to be a tiny house hostess. And my first overnight guests were family and they were up for a family adventure. Soon we will be hosting our friends. And I am so excited! Get updates on Just Wahls. Jul 24 Tiny House Birthday!! !